One of the biggest iOS accessory makers out there, Speck, is well-known for its comprehensive lineup of cases and more for the iPhone, iPad, and Mac. But the company has recently branched out into a new field with the recent introduction of the MightyPack line of backpacks. And to see how it stands up to the competition, I’ve been testing out the higher-end MightyPack Plus. The main draw of the $99.99 bag is that it is TSA checkpoint friendly. That means since the bag can be completely unzipped and lie flat on the X-ray conveyor belt, you don’t have to remove your laptop and place it into a separate bin. For anyone who travels, that’s definitely a huge time saver. The MightyPack, which doesn’t offer that feature, is $79.95. The backpack can lie completely flat so you won’t have to remove your laptop when going through airport security. 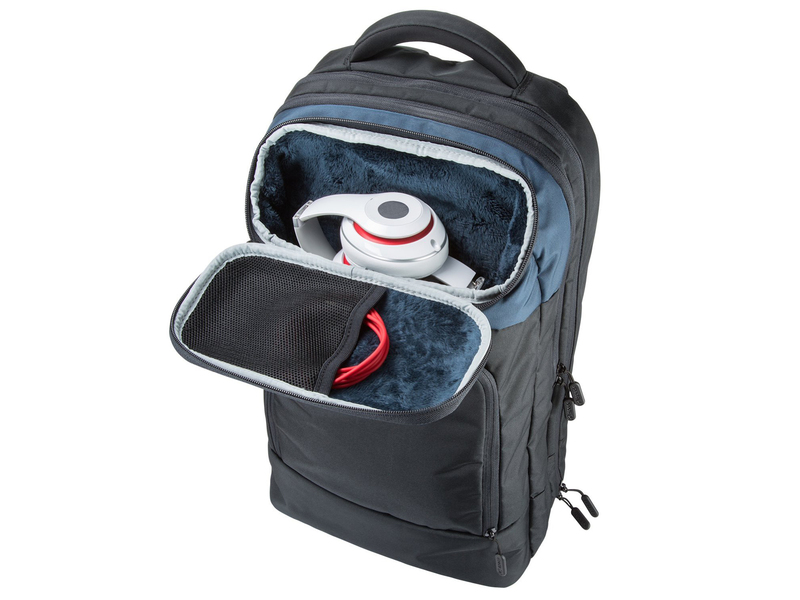 The standout feature of the MightyPack Plus is its Tech Locker near the top of the backpack. It’s reinforced with extra foam and lined with faux fur to help protect your delicate items. The pocket itself is roomy enough to hold items like headphones, and it also has a side pocket to store smaller things like your iPhone or glasses. I’ve been carrying the backpack for a few weeks, and have really enjoyed having the extra protection that the Tech Locker provides. I usually don’t put my iPhone or eyeglasses in my backpack because I’m afraid that they might get scratched or broken. But I’ve had nothing to worry about with the MightyPack Plus. Speck offers three different color options in the backpack line – black, blue, and pink. I’ve been using the black edition, and it definitely stands out from the crowd with its stylish look. The backpack can hold up to a 15-inch laptop, so it easily fits my new 12-inch Retina MacBook. Past the Tech Locker, there are three other main compartments. 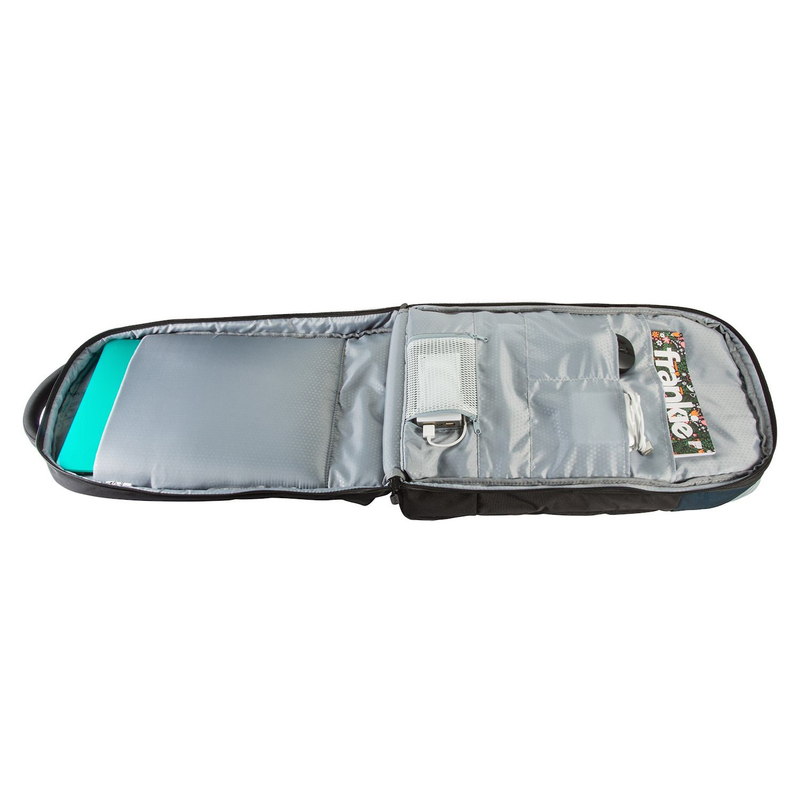 Below the locker, a zippered pocket can fit small accessories like keys, pens, and notebooks. With the pass-through feature, you can easily charge your iPad or iPhone with a battery pack in another part of the backpack. 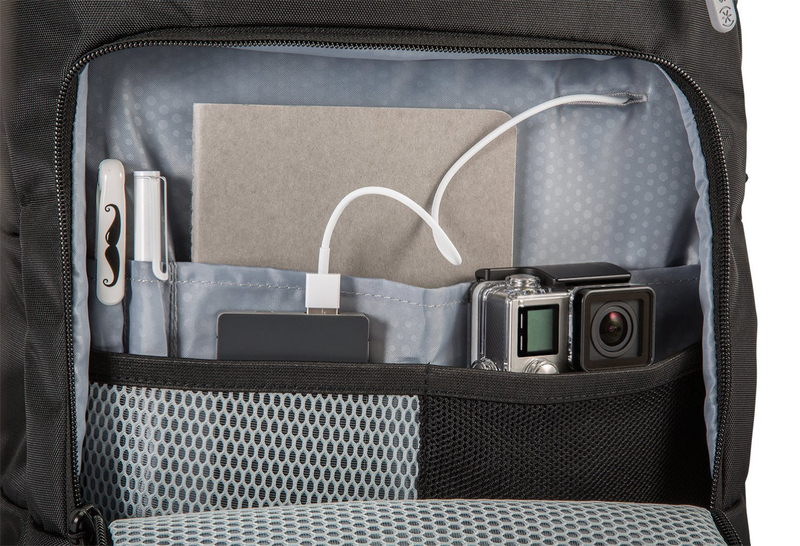 A second zippered pocket can hold things like an iPad or other larger items. The back pocket fits your laptop. Another nice feature of the MightyPack Plus is its pass-through cable system. For example, you can keep a battery pack in one pocket and place the cord through the hole to charge your iPad in another compartment. Other nice features include compartments that can flex to fit different sizes of accessories and a quick release strap to easily remove it when needed. Speaking of the backpack’s straps, they were definitely comfortable with a nice amount of padding for everyday use. Overall, the MightyPack Plus is a winner. The only negative I can find with the backpack is that you shouldn’t expect to fit a ton of items past your laptop and a few other accessories. The inner compartments are tall but not very wide. If I was going to school, I don’t think the backpack would be able to fit many large textbooks. I would have also like to have seen a pass-through slot in the Tech Locker as well. But past those issuess, I’ve definitely been pleased with the MightyPack Plus. While it’s expensive compared to other options, it’s made with high-quality material, and I feel like it would easily stand the test of time. Speck also offers a two-year warranty for the bag, which is a nice touch. If you’re looking for a stylish and practical option to carry all of your important electronics, its hard to go wrong with MightyPack Plus. 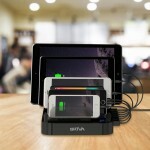 Fits up to a 15-inch MacBook or other laptop. 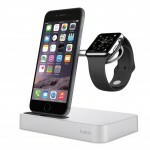 The Tech Locker feature is unique and is great for protecting smaller and fragile items like glasses or an iPhone. Airport friendly and can open completely flat for screening. You won’t have to take a laptop out of the bag. 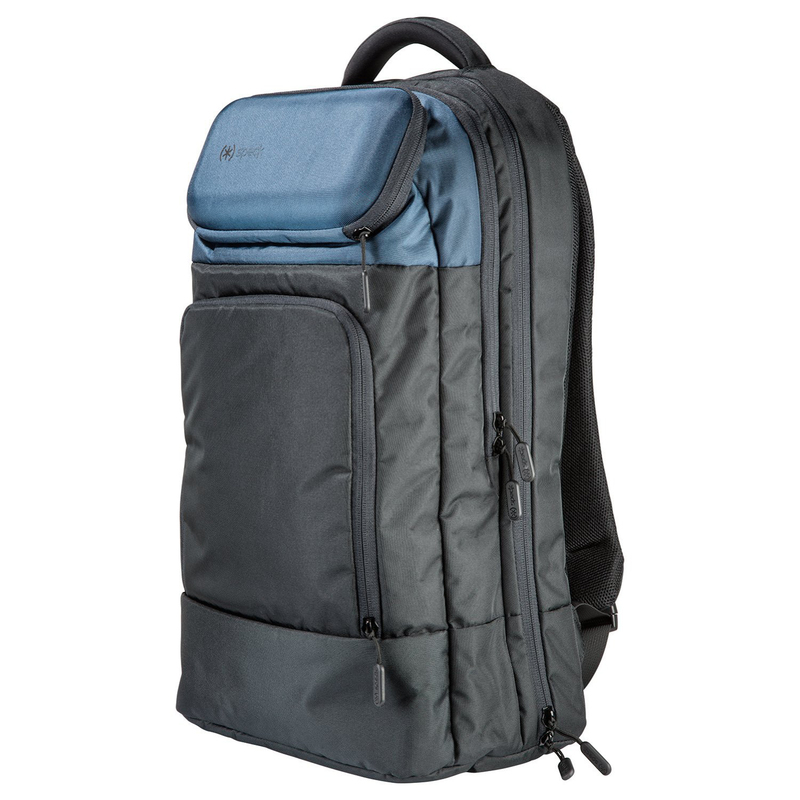 Speck offers a two-year warranty on the backpack. While the backpack itself is slim and light, it doesn’t have enough room to hold a significant amount of larger items like books. No pass through slot in the Tech Locker. Buy Now: $99.95 for the black and pink versions. $76.42 for the blue backpack.